With this application it is possible to control the ircDDB gateway software from Jonathan Naylor G4KLX remotely via an android device. You can connect and disconnect with your own ircDDB gateway to every D-star reflector, hotspot or call without holding your dstar transceiver. Start the ircDDBgateway configuration editor on your PC/server. Windows users: Press OK button and restart your computer or restart your ircDDBgateway application. Linux users: File -> save. Restart your computer or restart your ircDDBgateway service. If you don’t reboot or restart, the remote function will not work! 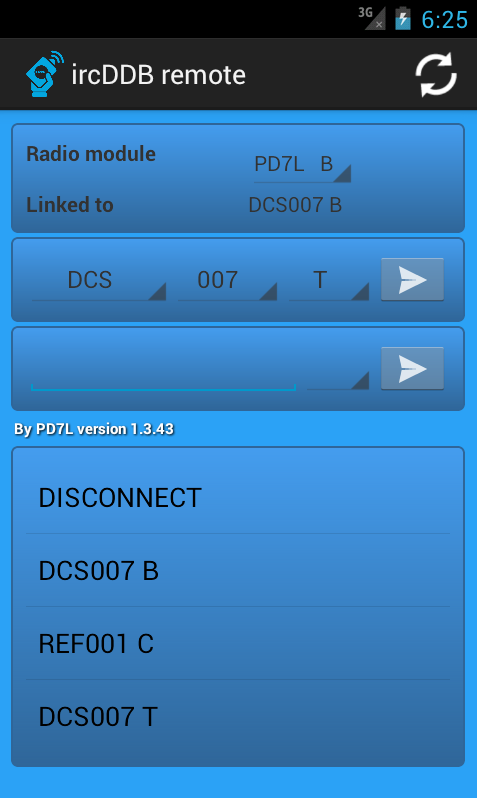 Now start the “ircDDB remote” app on your android device. Fill in your password at Password. If you have more than one ircddbgateway you can enable also the second server. Put your dstar transceiver on the frequency of your hotspot. Connect via selection: Within the mainscreen select the repeater that you want to use. Now select from the pulldown menu’s the reflector that you want to connect. To connect press the arrow on the right. You will see the State change to Linked. Your ircddbgateway is now connected to the reflector. You can now communicate via your dstar transeiver. Connect via manual input: Within the mainscreen enter the hotspot to connect to e.g. “PD0NUW B”. To connect press the arrow on the right. You will see the state change to Linked. Your ircddbgateway is now connected to the hotspot of PD0NUW. You can now communicate via your dstar tranceiver. Add reflector to favorites: Within the mainscreen select the repeater that you want to use. Now press and hold the connect button to add the reflector to the favorites. ( you can also do this trick for the manual input ),. Remove an entry from the favorites: Press and hold the reflector that you want to remove. See my app on amateurlogic.tv !!! Thanks!!! Thanks to Michael VK5ZEA there is also a great video with an explanation how to use the android application. If you have found a bug or want a new feature please email me. You can also contact me if you want to test the BETA versions ( you need a google plus account on your phone for this ). UPDATE: There is now also an iPhone/iPad version available on the Apple Store for free!! Good luck and many thanks for using this application!! If you like the product or encourage the development, please use the button below. Perfecte app, precies wat ik al een tijdje zocht! Dank! When a new IOS version? Can you add reflector 54 to the menu? Very nice app, I am using it very conveniently!! Thanks. Hi, I’m running the app on my Blackberry Z30… Excellent !! How about adding the possibility to execute remote commands, like those already configured in the IRCDDB Gateway interface ?? Thanx for using my app!! The G4KLX software is not accepting the remote commands. I have to ask Jonathan to implement it in his software. To execute remote commands you can use my other free app. Could you add a way to Sort, or Drag/Drop items on the favorites list? I will put this on my TODO list!! I hope bthe new android L will give this drag/drop feature by default. Application fabulous, very useful to all sysops of repeater D-Star, thank You. Apple Iphone version is comming soon ?? Yes. Since 2 weeks i own a mac and started with the ipad/iphone version. The most difficult part is the screen layout ( iPad,iPhone, landscape, portrait). Hope to finish the app in a few weeks from now. Very Good News !! I have android tablet and your app working very good, and now comming to my Iphone ! Thank you for taking your time in this project !! It is very appreciated ! That is GREAT news!~ Keep up the good work. Great app, very convenient. Is there a way to update REF, XRF, DCS, files? Or maybe input them manually? Thanks again. No is is not possible to add them manually. Once in a while I will update the list and upload a new version to the store. You can type in your reflector e.g. ( XRF001) and then the module e.g. ( Z ) in the middle of the screen and then long press the arrow next to it. Now your REF/XRF/DCS will be in the favourites list below. Will this work with a DVMEGA an a raspberry Pi.